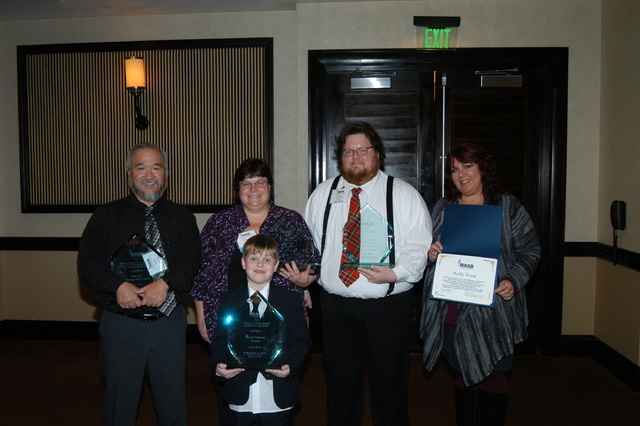 RENO—The Nevada Association of School Boards recognized four recipients from Nye County, including sports editor Vern Hee, at their annual awards banquet Nov. 26 at the Atlantis Resort and Casino. From left to right: Vern Hee, sports editor of the Pahrump Valley Times; Tracie Ward, Nye County School District trustee; Robin Williams, teacher Pahrump Valley High School and Kelly Wood, Nye County School Board secretary. Joe Crim NASB board president and school board member for Pershing County presents Pahrump Valley High School teacher, Robin Williams with his School District Employee Making a Difference Award at the Atlantis Resort and Casino in Reno. 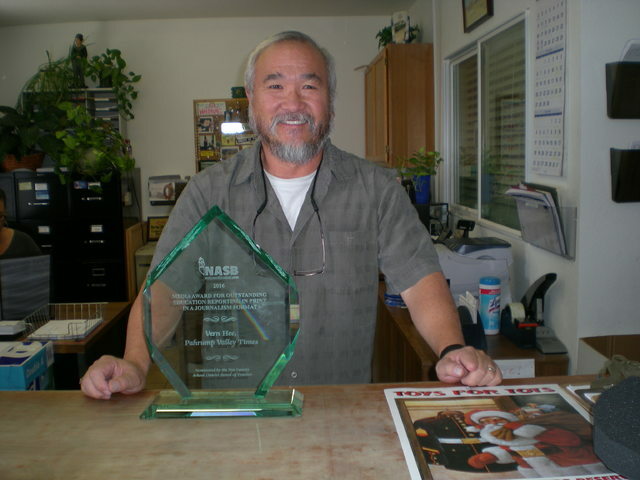 Hee won the Media Award of the Year for Outstanding Education Reporting in Print Journalism. Hee, who is the sports editor for the Pahrump Valley Times also coordinates coverage for the Times-Bonanza & Goldfield News. Hee was recognized by the NASB for reporting the school district news in a fair and balanced manner, maintaining a policy of no surprises by giving school officials the opportunity to comment and providing high-profile, positive news about the school district, student accomplishments and visiting schools. Hee said the award was humbling and something he didn’t expect. “My editor had told me I was covering this event up here and never even told me that I was getting an award,” Hee said. “It was a total surprise to me. My wife, who teaches at Rosemary Clarke Middle School, deserves some recognition for supporting me in my writing and believe it or not, she goes to a lot of these sporting events with me. The NASB is an association composed of all the school board members from all over the state. There are 17 school boards throughout the state. The NASB also recognized the following people from the Nye County School District: Pahrump Valley High School teacher Robin Williams, school board trustee Tracie Ward, and school board trustee Harold Tokerud. He was nominated by Nye County Superintendent Dale Norton. Williams received the School District Employee Making a Difference Award. He was nominated by the Nye County School Board. According to the awards description, Williams was recognized for his work as a great teacher but mainly for his work on different advisory boards he serves on. Williams said he was honored by the award. Williams, who teaches science, is an advisor to the RPG Club, student council, and the Renaissance Club. He said he works hard to get homeless students involved in the activities because students involved in activities are more likely to graduate. 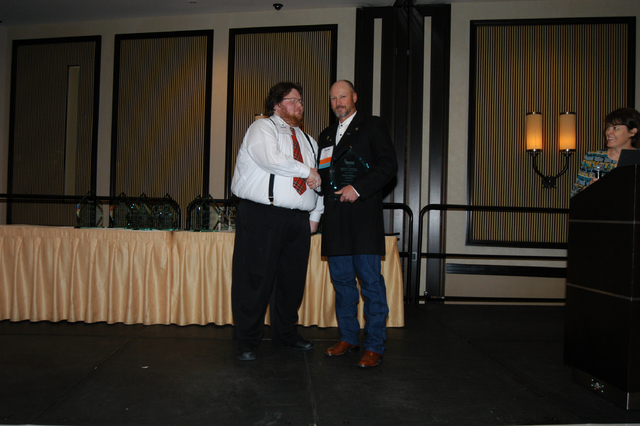 Ward was recognized as the Director of the Year of the NASB. The award recognizes the consistent, effective communication skills demonstrated during meetings of the NASB Board of Directors as well as the promotion of leadership skills and strategies for recognizing and rewarding student, administrator, educational staff, school, and district achievement. Ward was nominated by the White Pine County School District Board of Trustees. Tokerud was the recipient of the Veteran School Board Member of the Year. This award recognizes the dedicated service and leadership of local board members who have served for more than one term. After-school program volunteer, substitute teacher, interim principal, interim superintendent and school board trustee of Nye County School District, only one person has held all of these positions, Tokerud. Tokerud is in the last months of his third and final term on the Nye County School Board. Tokerud was unavailable for comment.